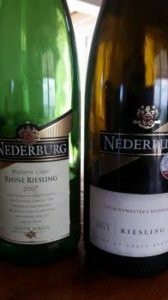 Will local Riesling ever amount to much? The observation was once made that all the spots most suited to the variety have been planted to Sauvignon Blanc so a world-class version is unlikely. It was SA’s 30th most planted variety at the end of 2014 with 164ha in the ground having declined from 290ha in 2004. Pronounced terpene character but also a little apricot and some nutty, earthy notes from time in bottle. Rich and full (abv 13%) with tangy acidity. A bit short on refinement but true to the variety and not entirely unsatisfying. A floral top note before lime and white peach and some subtle terpene character. Pure fruit with zippy acidity – well balanced if not super-detailed. What’s the deal with Howard Booysen’s wines? Since Groot Constantia ripped out the best Riesling vineyard in Africa, Howard Booysen arguably made the best Riesling here. He told me once that that very special vineyard is dying a slow death and he won’t be able to make too many more vintages from it, but I haven’t even seen a 2013 vintage anywhere. He’s also not featured at all in the 2016 Platter’s guide. @Kwisp There are whispers about a fallout with a former employer and the knock-on effects of that. I think 2012 was the final vintage with 2011 arguably the best he made. As far as I understand it he had been mentored by Bruce Jack as part of the CWG protege programme and possibly worked together on Jack & Knox Frostline Riesling as in introduction to the Swartberg vineyard he ended up using. It sounds like HB has pretty much gone to ground though and Bruce Jack may have access to the Swartberg vineyard for his The Drift wines. He may also know a bit more about HB. If interested, I have one bottle of the 2005 Frostline to compare against the 2010-2012 HB. Could be interesting, although very different flavour profiles. I’ve (prematurely?) polished off my last bottle of 2005 Frostline, but have the HB’s. I’d be very interested indeed, but I live in Kempton Park, so I’m not sure if a get-together will be practical, depending on where you are?